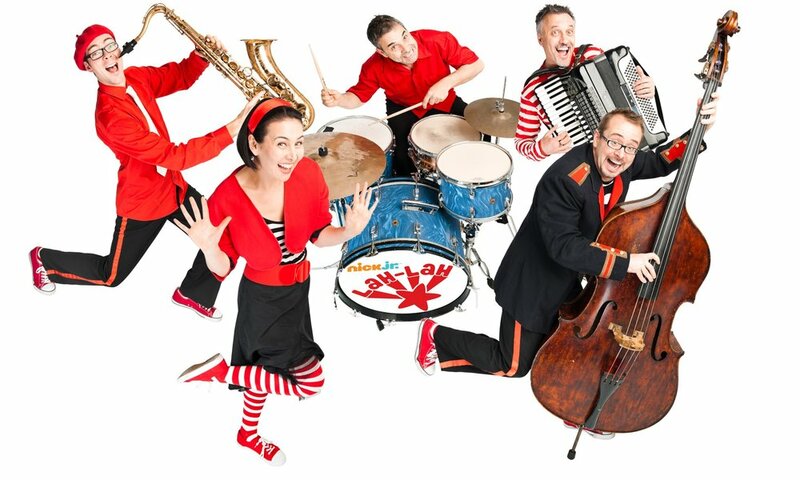 For a decade Australian band Lah Lah have delighted audiences with their charisma and musical prowess. They are currently on their biggest tour yet, celebrating their 10th Birthday with families across the nation. When we heard they were coming to Victoria we could not miss the opportunity to see them live. Read all about their show below! The warmth of the sun put a spring in our step as we made our way into Lah Lah’s 10th Birthday Party Tour on a brisk winters day. A decade of children’s music could tire oneself, but not in this case. The energy was aplenty and did not once wain. The five-piece band exude youth as they jump around in their stripy socks. They seem at home in their on-stage personas, unencumbered by the childlike dialogue. They genuinely seem to be enjoying themselves. Perhaps they are onto something, embracing youth like this. Many studies into well-being say that adults need to remember to play, too. In the dimly lit hall, most of the parents are. Even those who stood uneasily to the side had loosened up as the concert got underway and the atmosphere was jolly. The children are wide eyed, bushy tailed and eager, getting as close as they can to the stage as the Lah Lah show begins. The boys and girls are equally free to be themselves at this age and enjoy themselves without fear of judgement, which truly is a wonderful thing to behold. Lots of surprise elements add to their delight. Glistening bubbles descend from the sky, which sends them into a frenzy. A game of hide and seek has them guessing as Mr saxophon goes missing and Lah-Lah heads into the audience seeking. This is building their confidence and they are eager to tell Lah-Lah where he is. “He is behind you Lah-Lah!” They found him! The female lead Lah-Lah (Tina Harris) is much loved by the children and with good reason. She sings beautifully and is beautiful, smiling with warmth the whole performance through. Her chief sidekick Buzz (Mark Harris, also her husband) is a great partner. Their banter and chemistry shines. There is something childlike about both and indeed the whole band, despite their years. Their craft is one well honed. Lah Lah’s is a class act. Their set design is eye catching and colourful, but not overbearing. The merch is cute, the aesthetic is appealing- not too girly or too masculine- but falling someplace in-between. As for their performance, it went off without a hitch. Each band member is a talented musician in their own right, leaving space for little hijinks and jokes. They had flow. Their use of humour was effective and Buzz was very funny at times and the parents chuckled along. Questions posed to the children invited interaction and thought- and to put the icing on the cake (there was a birthday cake made) their songs are educational. Things such as doing up your seatbelt provided positive messaging. The children were curious, encouraged and enthused. The art of performance, song, dance and storytelling is like no other and gives respite from all that is wrong in the world. For one hour, everyone’s brains were redirected. So often children’s entertainment is lit up in fluorescent lighting which can deter the grown-up side of the audience, but the atmosphere at the Glen Eira Town hHall was set for a gig and it was relaxed. Worries and chores were dulled as the loud music, and bright stage directed everyone toward the live performance. It was immersive. After the show, the band braved the zealous crowd with their instruments. The following encounter with a saxophone or big bass might inspire one of the young ones. This little concert on a Sunday afternoon in the Glen Eira town hall might set them on new path. In a time when children have a reliance on screens and technology to fuel their creative brain, a concert such as this is vital to show them how fun and rewarding real life creativity can be. You guys are a class act. What works so well after all these years? We really try to keep the music as much like the music we play in our adult bands as we can, not dumbed down at all. Lyrically, and with our dialogue, we try to stick to themes that are relevant to pre-schoolers without talking down to them. No birthday cake at a birthday party is a big deal to a 4 year old! What inspired the band initially? How has it changed over time? Mark and I started Lah-Lah back in 2008 on the back of pre-school music and movement schools I was running in Sydney. At the end of some classes Mark would come in with his double bass and we’d play some nursery rhymes together and the family’s loved it. Really, they were the ones who encouraged us to start the band. At the time (and to this day) Mark was playing with triple ARIA winning gypsy band Monsier Camembert, so that music and of course jazz (all the band are accomplished jazz musicians) are a huge inspiration. I trained as an opera singer, so I like the melodies to be lyrical, clean and pure … and of course lots of fun! Nothing has really changed from those early days, except that now all of the band members contribute songs to our albums, wheras the first two where written entirely by Mark and I. We just love what the other musicians bring to our music! You genuinely seem to enjoy the show from start to finish. How are you enjoying the tour? Yes, we do! Walking out onto the stage is really the moment we relax and have fun. All the pre and post tour prep, pack up, travel, promotion etc. is really full on. The stage is where we feel at home and most relaxed and comfortable. The tour has been amazing, so many beautiful families taking the time to bring their littlest to see us is so humbling and fun. Truly the post show meet and greet sessions are so hilarious and surprising … there are so many stories we’ll never forget.